As a child of the 1970s and 80s, I grew up coveting the Barbie Townhouse, Baby Alive, and whatever toys were sold during Saturday morning cartoons. Coming home in middle school to an empty house, I flipped between General Hospital and Guiding Light, while my younger brother whined that I didn’t let him watch He-Man. My Jewish mother made our Christmases magical. 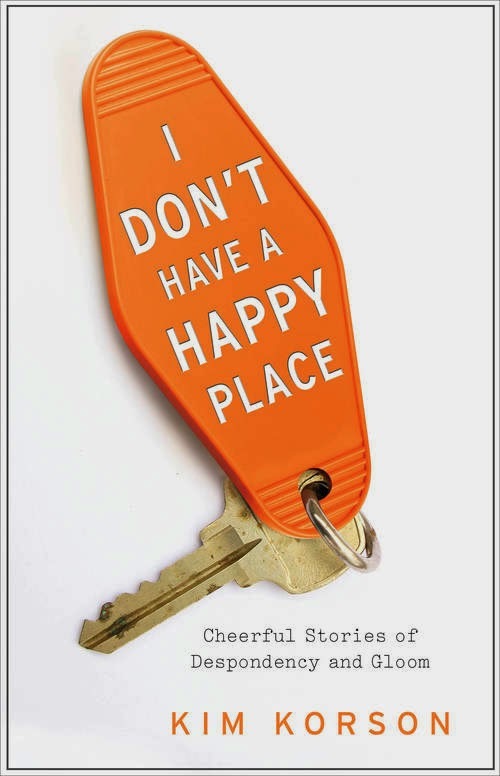 All this I have in common with author Kim Korson, who chronicles a neurotic childhood and adulthood in a series of essays in I Don’t Have a Happy Place. Kim might not have a happy place, but she’s a talented writer and her narratives are funny and warm. She starts in childhood, envying a perfect neighbor who has a ton of Barbies and that magical Baby Alive (I never got one either, Kim!) and a babysitter who drowned right in front of her. The essays cover high school, college, first jobs, marriage and kids. Along the way, Kim finds out about the perilous mental health of many family members. The grandfather who always seemed out of sorts? Turns out he was heavily medicated for paranoid schizophrenia. And when her grandmother dies, he stops taking his pills. The book summary describes Kim as a malcontent, but she’s really not as unhappy as she thinks she is – at least the writing doesn’t come across that way. She’s not a depressed, woe-is-me type person – she’s just very aware of the bad things that can happen when you’re anticipating a happy event. She actually has a great life, and if the writing were as negative as she seems to think it is, it would be very difficult to identify with her. But it’s not – she’s wry and observant, cynical in a way that’s nearly required to cope with life today. And maybe it’s something in the genes. Recent research has shown that memories can actually be passed down through DNA in some way – that people who’ve undergone trauma pass on those traumas to their descendants. So if you’ve descended from a persecuted minority, it makes sense that you’re always anticipating the worst, because the worst happened to your ancestors – and they survived at least long enough to pass on their genes to you. So we’re not cynical because we’re ungrateful. We’re cynical because thousands of years of people trying to kill us has taught us at the cellular level to always have a bag packed, or at least to be prepared to be miserable at Disney World. So don’t cheer up, Kim … your writing is perfect just the way it is. Plus, if we’re ever hit with a killer flu or zombie apocalypse, I have a feeling your Vermont home already has a basement filled with bottled water and canned goods.